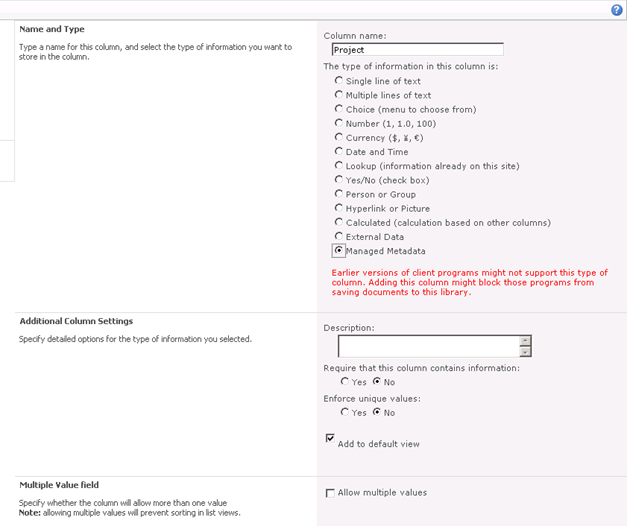 Managed Metadata is a really cool new feature in SharePoint 2010. You can centrally define metadata which can be used across Site Collections. This Term Sets can be statically defined by a Group Manager or dynamically extended by your users. I will show you how to create such an Group and Term Set and how to include it in a Document Library. First of all you have to start the required Web Service. 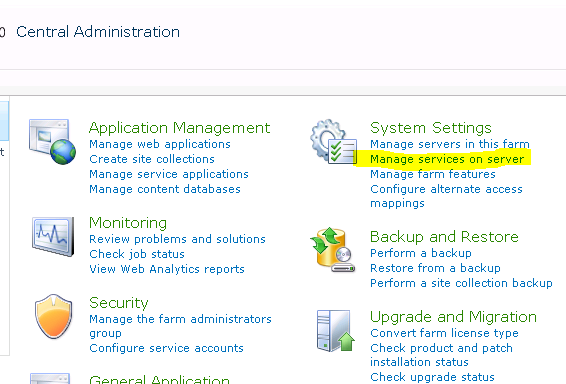 So within the Central Administration click on the link “Manage services on server“. There you’ll find the “Managed Metadata Web Service“. Use the “Start“-Link on the right side to start it. 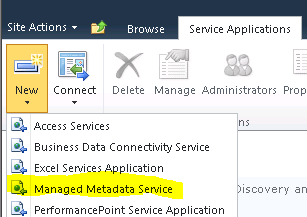 Now we have to create a service application which handles the managed metadata. 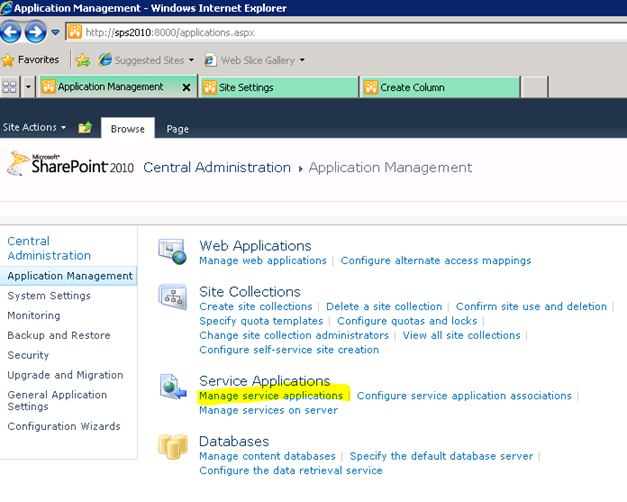 In Central Admin within the Application Management use the Manage service applications link to get an overview of the currently created service applications. 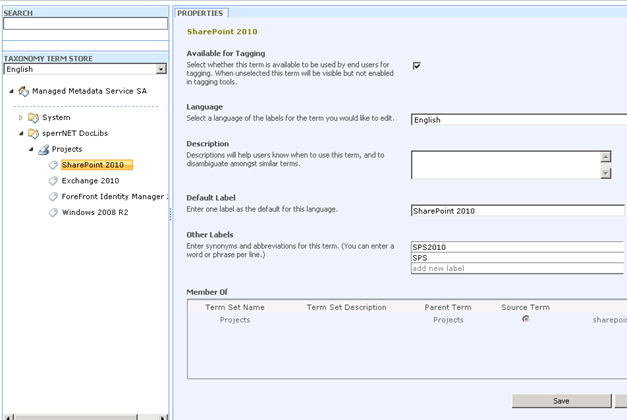 Side Note: Service Applications are the follower of the Shared Service Provider (SSP) in SharePoint 2007. 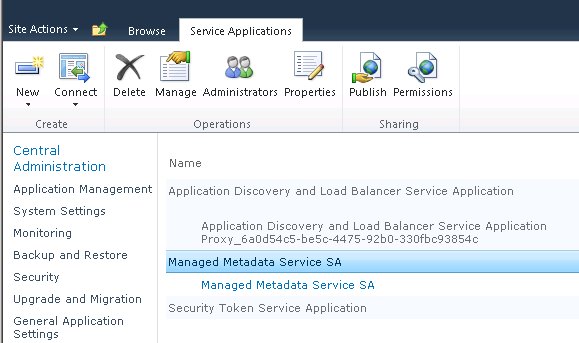 Use the New Button at the Service Applications Ribbon and choose “Managed Metadata Service“. Enter your desired options. The options are self-explaining. After the creation process you find your new service application in the list. 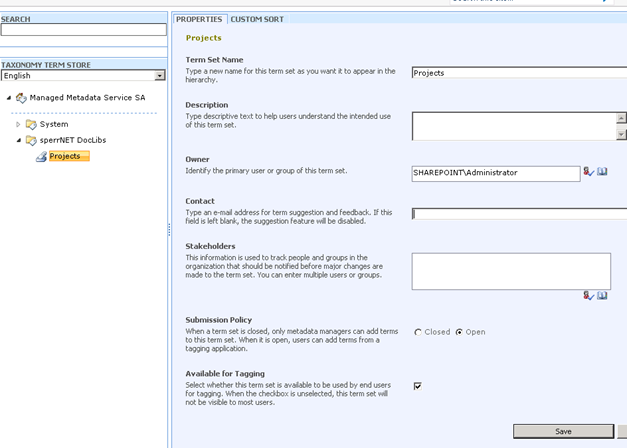 Click on the Name of the Service Application or highlight it and use the Manage Button within the Service Applications Ribbon to enter the Term Store Management Tool. First of all we have to create a new group for our Term Sets. When moving the pointer over the name of your Service Application (in my case its “Managed Metadata Service SA”) a little arrow appears. After clicking on this arrow the below showed menu appears. Now use the New Group link and enter the name of the group. After entering the name you can hit Enter and the properties of this group are displayed. I think the options here are self-explaining as well. 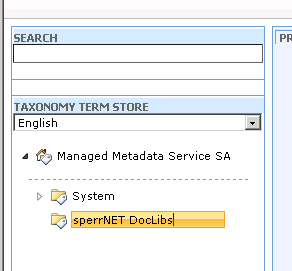 Now create a Term Set which will hold our Terms (Metadata). The Term Set is the part which will be used in a column. Basically it’s the same process as the creation of the group. 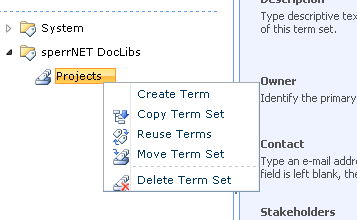 Move the pointer over your group, click on the small arrow and choose New Term Set. It’s also possible to import a CSV-File. After hitting Enter again you’ll find yourself in the properties of this new Term Set. Especially the “Submission Policy” setting is interesting. If you want a dynamic list (which is extendable by your users) you have to change this option to Open. Once again, we have to use our little arrow to create new Term’s inside this Term Set. You can define multiple synonyms for each term. If this synonym is typed by one of your users the right Term will be displayed as suggestion. 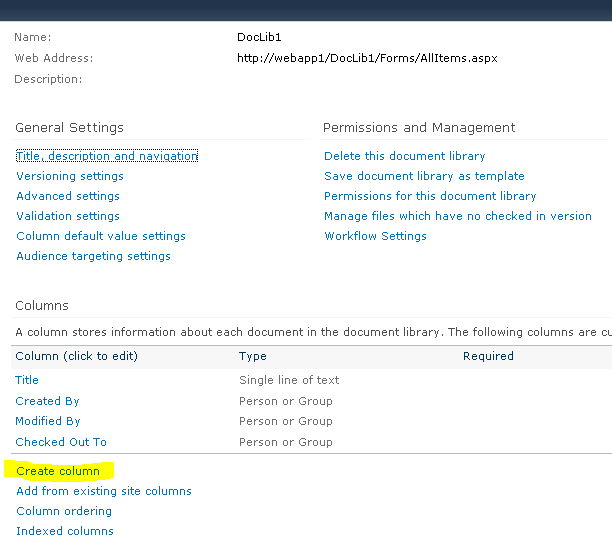 Create a new column in a List or Document Library within your Site Collection. 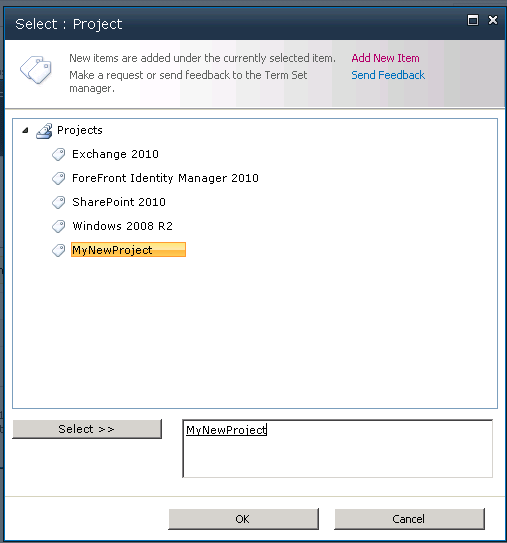 Enter a Column name and choose “Managed Metadata” as information type. Puhuu, what’s that? 😉 I’m not sure if it’s just a bug within the RC1-Edition, but we have to enable the Term Navigation through PowerShell. Yep, the required feature isn’t available through the “Site Feature” list inside the “Site Settings”. 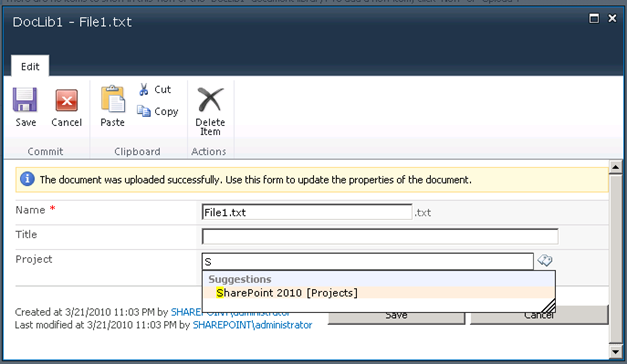 Start PowerShell and add the SharePoint SnapIn so the required cmdlets are available. Enables the “TaxonomyFieldAdded” feature for the specified Site Collection. This one is required for the Taxonomy Browser. A list of all available features on this Farm are displayed which have tax in their name. This would be an option to get the ID of the feature. The other option would be to try to create a column while this feature is disabled. You will receive the error: “The Taxonomy feature (Feature ID “73EF14B1-13A9-416b-A9B5-ECECA2B0604C”) has not been activated.<br>A term set or anchor point was not selected”. So, feature is activated and we’re ready to use it. Refresh the page. 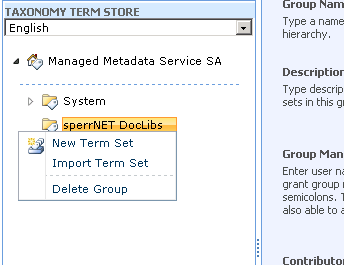 Now your Managed Metadata Service Application with the Group and Term Set is display. If you want the Term Set to be dynamically extendable set “Allow ‘Fill-in’ choises” to “Yes“. After using the “OK-Button” to create the new column just upload a document. Our column is displayed and while you’re typing a value relevant suggestions are displayed. You can also click on this tiny cards (or whatever it should be) on the right side of the input box to display all available Terms. This is also the required step if you want to add a new Term. That’s it 😉 You can also try to add a column which is using your Term Set on another Document Library and even on a DocLib within another Site Collection and you’ll find all Terms. There are still some open questions for me where I have to play more with this feature. Especially with permission on the Term Sets and Groups. 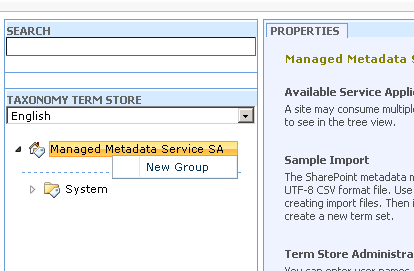 But all Managed Metadata would solve a lot of troubles we all had with SharePoint 2007. Thanks for posting this. I do not think that I would have worked out how to get around the column issue without it. Your post save my brain’s health ! But how do you configure the column type to not use an anchor point or term store. 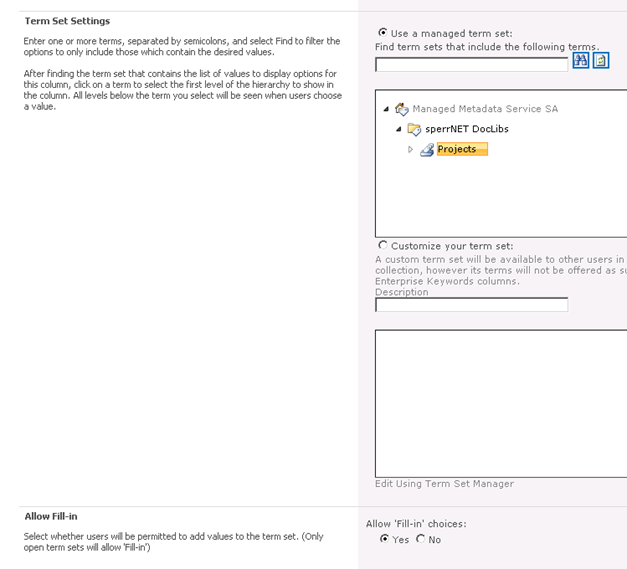 (I would like the users to be able to choose from more than one term store). This is because i have set different permissions for different terms store and it also acts as a filter for finding key metadata.